I have been posting intermittently on this blog for many years, but I have opted to move to a new venue. Most of the content from here has migrated over. To read of the ongoing adventures and nonsense that is my life, simply go to bevgrondin.ca. He’s been taking accoustic guitar lessons for the past year at a local music school. Once a week for 30 minutes he sits with his teacher and furthers his skill and knowledge, and I am inspired by all the young musicians developing their talents in other small rooms throughout this converted house. The window is open in two of the rooms facing the backyard, where I sit. From the basement I hear as a young boy, a couple years older than my guy, learning to beats to Don’t Speak by No Doubt. One floor above, I hear someone else learning a classical song (don’t ask which one!) on the upright piano. And while I can’t hear him, I know my young man is learning how to play one of the traditional songs in his lesson book. I’m amazed and impressed by these young people who willingly let the world hear their talent, develop their passions, and generally just challenge themselves to learn a skill they can carry with them for the rest of their lives. I have a fascination with taking photos of my boys as they are walking away from me – on their first and last days of school, or as they strut down the street with friends. When they don’t know that I am watching, they show me a part of themselves that is usually shielded when they pose for photos. The symbolism of these photos is not lost on me – my boys walking away from me into their future and slowly gaining their independence. They are ready for it, even if I’m not. This is the first time that I am not quite ready for them to head back to school. 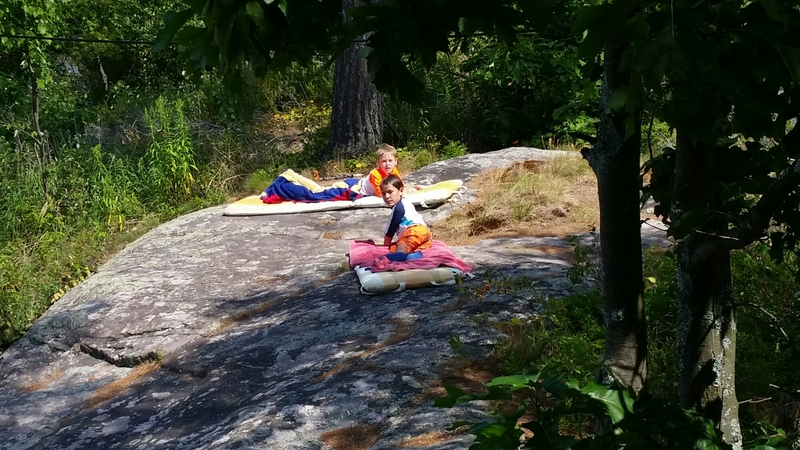 We have had such an amazing summer – lazy days at the cottage, swimming in the lake, playing board games, searching for frogs, and being ever vigilant for snakes! Of course, there were moments and days when they drove me bananas with their bickering and wrestling, but for the most part I got such a thrill in being able to enjoy getting to know them, and the persons they are becoming. Here they are off to Grade 5 and Grade 3. While they are still so young, I am acutely aware that there are precious few years left where they will be content to spend their whole summer with just the three of us (and Daddy when he’s not at work). I am so blessed to be able to spend my days with them, and I just didn’t want these days to come to an end. Just as my twisted left ankle was starting to feel better, I fell victim to another random injury. This time, at least I have a good story to go along with my banged up ankle. Let me set the scene: after resting my left foot to the point where I felt steady enough to walk to the water, I decided to bring my little guy on a canoe ride around the Bay. Using my super strength, I coaxed the large, fiberglass canoe from the boathouse into the water, held it steady while my kiddo boarded and gingerly climbed in. We have a double-ended paddle that makes solo paddling a breeze. So, we were off, keeping to the shallower parts of the Bay – it was getting fairly windy and it’s been a while since I was in control of a canoe; it would have been bad for my credibility if I’d capsized with my little guy on board. Trevor and Brendan swam out to the raft do I dropped off Nathan to jump into the deeper water with them. I also felt like swimming so I decided to return the canoe to shore. All was going well; I managed to align myself close to our stairs (without crashing into them!) and started to climb out while firmly keeping hold of the canoe. Just as I was dipping my foot into the water, a wave hit the canoe, knocking me off balance and forcing my foot against a couple of rocks. My ankle turned purple almost immediately but it wasn’t until I was out of the water and trying to walk that the real pain set it. I think this is the universe telling me to sit down and relax. I guess I have no choice!